When Spring Morrison asks the Easter Bunny for a perfect man, she has no idea that her mother will use the opportunity to play matchmaker with Wade Parker. Does mother know best? Summer Woods is starting a new life with a new identity. Can Officer Nathan Lockhart protect her from her past while he's falling in love with her? Young and pregnant widow Deidre feels her life is over until she becomes the patient of Dr. Jeremy Saunders. Can he help her let go of the hurts and burdens that weigh her down and embrace life again? To Dan Jensen, life seems hopeless. But when he gets railroaded into performing in a Christmas musical, a lovely young woman named Amy Roberts provides more than musical assistance. She brings hope and the promise of a new life. The First Season of the year, Spring…..Spring Morrison, widowed 4 years earlier and raising two children, cannot make her mother understand she does not need a Easter Basket this Easter. To satisfy her mother, she finally relents and tells her all she needs is a man in her life. Mother knows best or does she? In her match making opportunity, she provides a Easter present in the way of Wade Parker. How will this turn out? The Second Season , Summer. Summer Woods , uncovers crooked police officers in the drug task force. Now, they are out to kill her. In the witness protection plan with a new identity, the first person she meets is a state trooper. Can she get over her fear of not wanting to be around a police officer? Will Nathan Lockhart help her to see that not all officers are crooked? Along Comes Fall, a beautiful time of the year. Deidre McBride is young, expecting her first child, and already a widow due to the war. Trying to finish college, and keep her job at the Gallery of Arts, she is in danger of losing her baby. Through the fast assistance of Dr. Jeremy Saunders, she recovers. Can this young Doctor help to ease her hurts over the loss of her husband and show her she can embrace life and love again? Winter is upon us: Dan Jenson was worried;, life was hopeless for him. His life was just not the same with his divorce and raising the two daughters. Then, somehow they hooked him up to perform in the Christmas Musical at Church. Could he do this? With the help of the musical assistant--a young woman, Amy Roberts, can Dan find new meaning in life? Can she bring him hope and peace? Be prepared to shear a tear or two. These are four amazing authors with a great flair for writing inspirational romance. The First Season of the year, Springc..Spring Morrison, widowed 4 years earlier and raising two children, cannot make her mother understand she does not need a Easter Basket this Easter. To satisfy her mother, she finally relents and tells her all she needs is a man in her life. Mother knows best or does she? 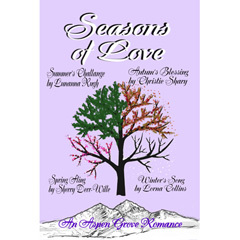 Want to know what happened after the end of Winter's Song? Amy verified the facts for me. Many thanks to Amy an Dan and their wonderful family for allowing me to tell their story.